Dolce & Gabbana Light Blue is a perfume for the ladies. It was created in 2001 by Olivier Cresp. The Bois De Jasmin site says in there review that Light Blue smells similar to Paco Rabanne Black XS. Most users of light blue say that the scent is beautiful, light, very clean, unfussy, makes you feel elegant and lasts all day long. Some negative comments from customers using Dolce and Gabbana say it only lasts for 2 hours. A few users have also warned others about cheap imitations. When buying anything online always be careful to check the credibility of the seller before you purchase the item. 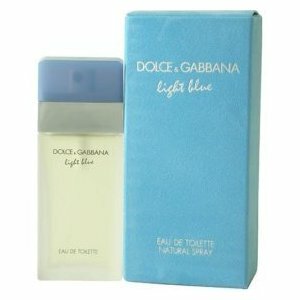 Dolce and Gabbana Light Blue ranges in price from $15-$80 depending on the size of the bottle and where you purchase it. So just be sure to shop around for this one as it could end up saving you a lot of green. This entry was posted on Friday, July 16th, 2010 at 3:33 pm	and is filed under Dolce & Gabbana, Fragrances, Reviews. You can follow any responses to this entry through the RSS 2.0 feed. You can leave a response, or trackback from your own site.